Hopefully soon I will be introducing more color back into my wardrobe, and transitioning my workwear from jeans, boots, and a sweater into what I feel more comfortable in, skirts, dresses, blazers, and heels. This outfit was a good start, though I must confess that I wore boots to work, and it was only as I was leaving in the afternoon that it had subsequently warmed up enough for me to throw on heels for photos and my errands. I'm a fan of both tartan and denim trend.. Pulling this off together is really a bomb.. AMazing styling..
Love the color of those shoes! I really hope the weather warms up soon. This is not fun. I totally feel you, Lydia. I am dying to pack up my tights for the year and say sayanara to cold weather styles. It was super warm in Seattle for a couple weeks and is currently back to cold and drizzly (just in time for spring!). I have a new little blazer I'm dying to wear with a dress, thanks to your inspiration! 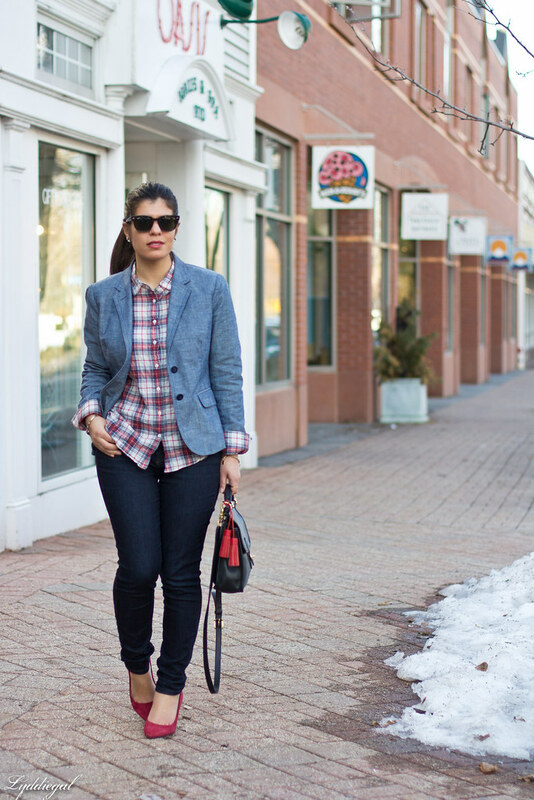 This blazer is perfection on you, I love it with the plaid! Love this look!! And I am in love with those heels! The color is gorgeous. Love your chambray blazer and the fringe detail on your handbag. 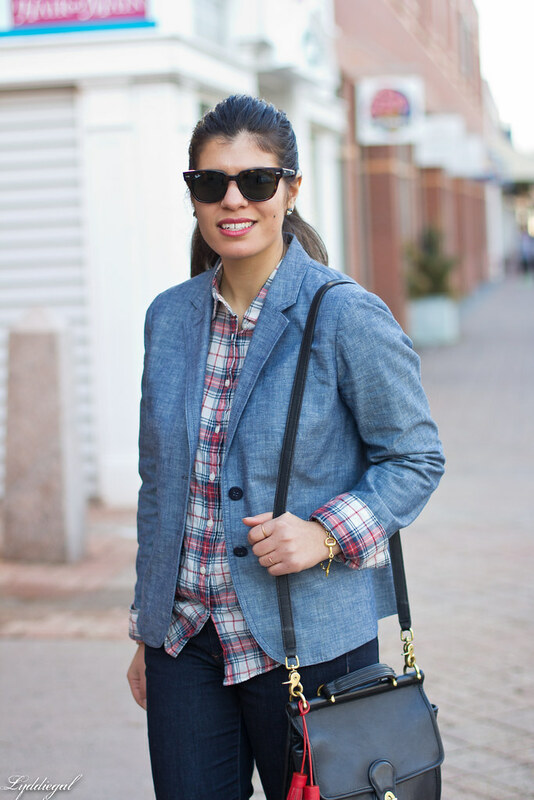 Lovinggggg that chambray blazer- super chic. And I love the color of those pumps! I like the chambray jacket with the plaid shirt and its good to see less snow and to know that Spring is coming soon . 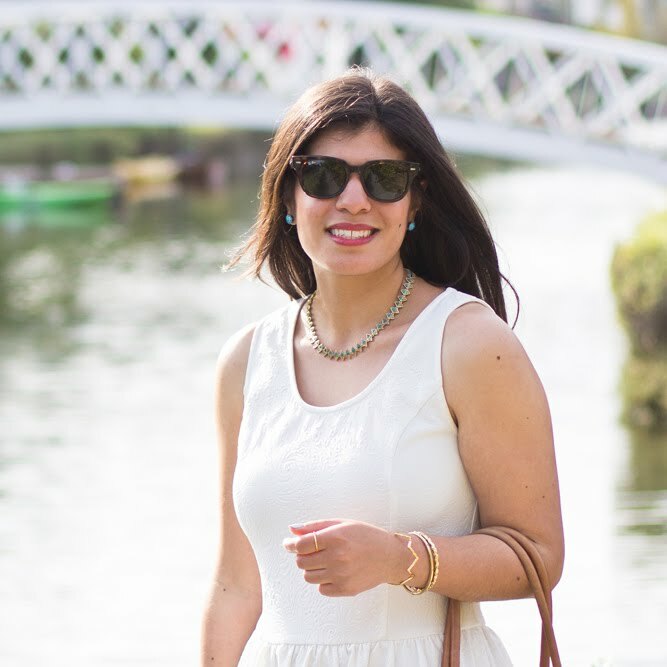 You've made this so sophisticated (which is no mean feat for plaid and denim) - I love it! i'm loving those red suede pumps on you and so glad it's starting to warm up for you! This looks is wonderful! I the that blazer with the plaid! I'm in love with your blazer! and the color of your heels is so pretty! 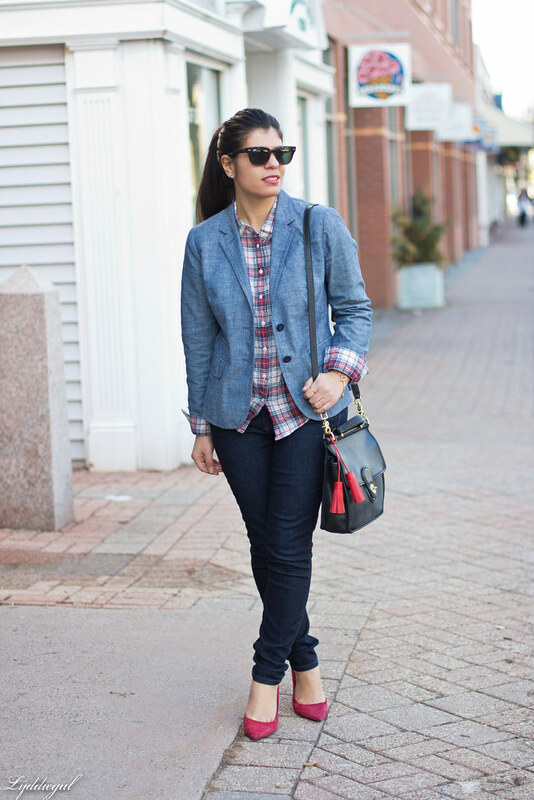 How fabulous is that chambray blazer?! Love it with the plaid! Gorgeous! I was so taken aback, seeing you without a coat after the crazy winter you've had. It's a wonderful change, though, and I hope more warm weather is coming your way because I know you're anxious to be back in your favourite skirts and dresses and, since you have one of the most enviable summer wardrobes I know of, I'm not going to lie - I'm a little anxious for that, too ;) Plus, your heels deserve to be taken out, this pair is just gorgeous! I truly hope that day comes for you sooner than later although I love your winter looks--especially this one! This blazer is such a score. I love it with the plaid! I love this look and a great fan of chambray. This is spring transition done perfectly--that blazer is awesome and I love those heels! Glad it warmed up a little! Casual and chic. Blazer and heels are awesome!! 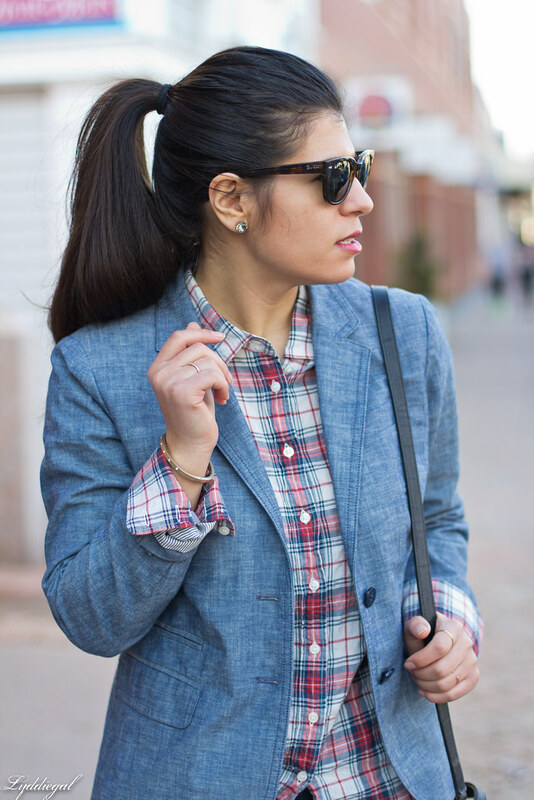 Love that chambray blazer! I need one of those! We all want warmer weather for skirts, dresses, and maybe even a pair of shorts (gasp!)! I love the way your red shoes bring out the red in your shirt. Those jeans look amazing on you! Love this look and I may have said this before but I love your hair pulled back! So chic! I love that you aded the red tassels to the bag. Love the denim jacket and the plaid shirt and oh those pumps! Great color! I LOVE this outfit from head to toe. The jacket, the heels, the purse. ALL of it is perfect! 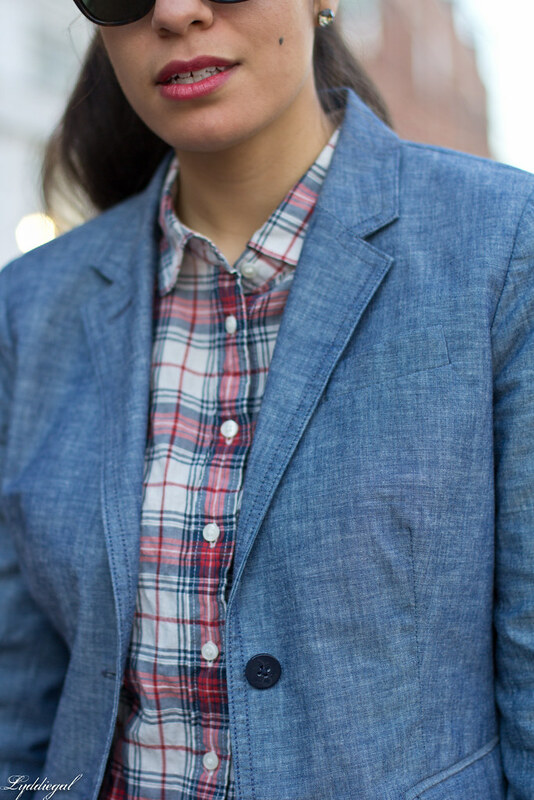 Chambray and plaid are a match made in heaven.